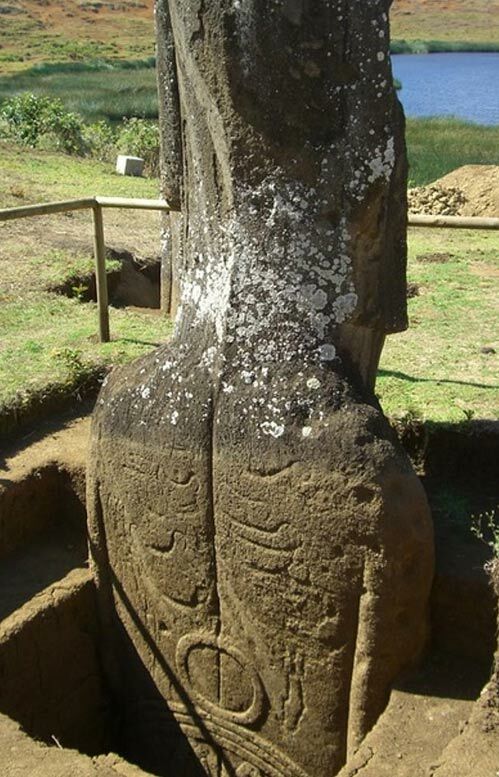 As it turns out, the famous MOAI statues –dubbed by some the ancient TITANS of Rapa Nui— are not just massive heads. These enigmatic statues are complete and have massive bodies buried under the surface. 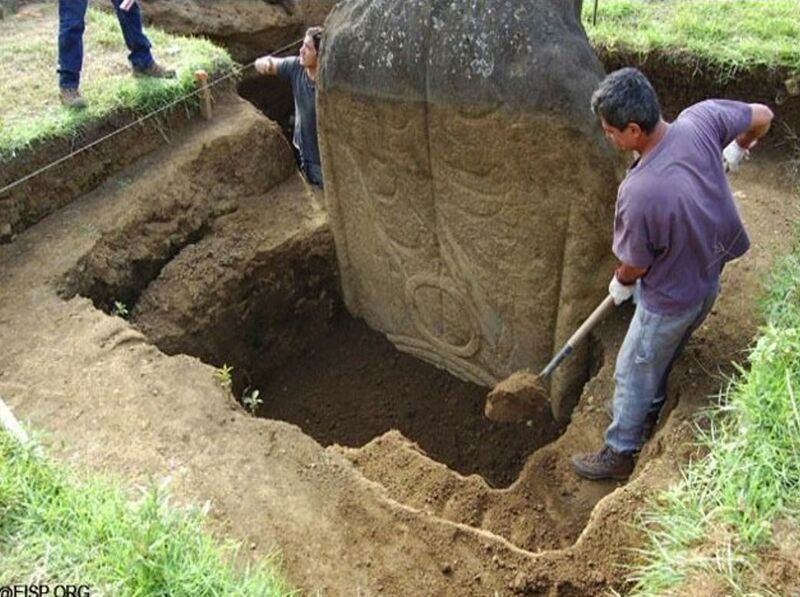 One of the greatest archaeological mysteries are without a doubt the mysterious MOAI statues located on Easter Island. According to excavations, the massive statues are more than just heads. Some statues have even been found underwater. The enigmatic Easter Island Statues are a set of hundreds of MASSIVE, ancient carved figures that stand guard on the hilly Pacific landscape of Easter Island. 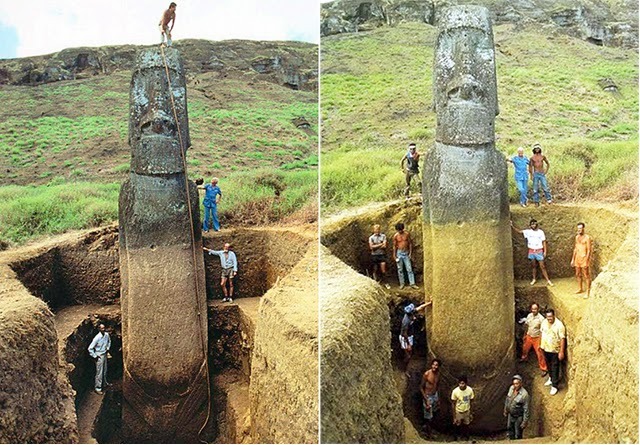 Now, excavations have proven that these massive statues aren’t just massive heads. Ever since the earliest excavations in 1914, the mysterious statues have been heavily debated in the archaeological community. Who built them, what are they depicting? What is their purpose and how were they made? The statues –traditioanlly called ‘moai’ were carved in ancient times out of volcanic rock by the ancient Poylnesians. So far researchers have discovered statues ranging in different size, and the tallest of the statues rises a staggering 10 meters in height. Their significance is still heavily debated although some scholars believe they were representations of the indigenous peoples’ ancestors. However, the Moai statues are more than just massive heads and staggering bodies built out of volcanic rock, elaborately carved by the Rapa Nui people on a remote Chilean island in the Pacific Ocean. As it turns out, the Moai statues may also hold the secrets of the fountain of youth. A drug called Rapamycin —a bacterial by-product—was found to live in the shadow of Eastern Islands famous Moai statues and is believed to increase lifespan and improve a number of conditions related to aging. As we mentioned in previous articles, some 50 years ago researchers at Easter Island found a natural drug that was hiding in plain sight inside the soil at Easter Island. As it turns out, half a century later, experts are calling it the anti-aging fountain or the fountain of youth. The drug called Rapamycin is a bacterial by-product which can be found living in the shadow of Eastern Islands most famous statues the Moai. The bacterial by-product has shown to increase lifespan and improve a number of conditions allegedly related to aging. As you can see the Moai statues are shrouded in mystery. They are huge, they aren’t only massive ahead. They have bodies. Scientists are still unsure as how they were built. Their meaning is not fully understood. And living in their shadow is a bacterial by-product which has shown to increase lifespan and improve a number of conditions allegedly related to aging. New images from the 2012 excavation of Easter Island’s iconic statues reveal the renowned heads are not only connected to giant bodies, but the bodies are covered in mysterious designs and symbols, which researchers have likened to tattoos. News.com.au reports that a previously unseen series of photographs show in fascinating detail the excavated bodies of the distinctive stone humanoids. Archaeologists were surprised to find that the stone bodies, shielded from environmental weathering beneath the soil, are decorated with ancient details —whirls and crescents believed to be tattoos. Researchers say the crescent shapes might represent the canoes of local Polynesians, though this is just one theory. The Rapa Nui people who originally settled the island centuries ago erected 887 amazing giant stone statues called moai. The moai have proved to be an enduring mystery with many lasting questions; how and why were they built; were they purposefully buried or did time bury the statues under silt; why do some face away from the sea and towards the island; how were the heavy stones moved around the island; why do some sport heavy red stone hats? Researchers hope to answer these questions and more with investigations. Director of the Easter Island Statue Project, Jo Anne Van Tilburg says, “The reason people think they are [only] heads is there are about 150 statues buried up to the shoulders on the slope of a volcano, and these are the most famous, most beautiful and most photographed of all the Easter Island statues. This suggested to people who had not seen photos of [other unearthed statues] that they are heads only,” reports news website IBTimes. Initial excavations in 1914 revealed some of the bodies of the giant volcanic rock statues, which can weigh up to 88 tons and be up to 10 meters (33 feet) tall. The hands of some of the statues can be seen to wrap around to the navel. Academics speculate the stylized figures represented ancestors or high status tribal figures. It is theorized that the stone was quarried on the island, and next it was carved and decorated at the quarries, and then finally the statues were “walked” slowly across the islands to their final positions as guardians protecting against disaster. Jean-Michel Schwartz says in his 1975 book ‘The Mysteries of Easter Island’ that he believes the statues were not moved by wooden rollers or sleds but rather by using ropes around the statues which ‘walked’ the statues in the same way as one might walk a refrigerator; by tilting it first to one side, shifting the airborne portion forward, and setting it down again. By this method, the statues would truly walk in a waddle fashion around the island. Easter Island was settled between 300 AD and 1200 AD by Polynesians who eventually became the Rapa Nui. Between the 10th and 16th centuries the island community expanded steadily, with settlements being set up along practically the entire coastline. Following this period, however, the population took an extremely rapid decline dropping from 15,000 to approximately 2,000. Past theories explained their demise as the result of economic and social crises due to environmental deterioration: deforestation leading to land erosion. However, recent studies suggest the arrival of Europeans in the 1700s, and slavery and smallpox, are factors which probably devastated the population of the Rapa Nui. Work continues on the island through university-led research, and the Easter Island Statue Project, along with assistance from the Rapa Nui people. Galleries of images of Easter Island discoveries can be seen at the EISP.org site, and others are currently being viewed on social media site Imgur.